Tens of thousands of people have demonstrated in the Gaza Strip against the Middle East peace conference in Annapolis, in the United States. 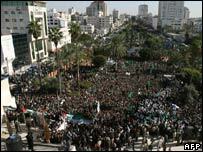 Leaders of the Islamist movement Hamas, which governs Gaza, said the summit was "doomed to failure". Smaller demonstrations, staged in the Fatah-governed West Bank, were broken up by police loyal to Palestinian President Mahmoud Abbas. Earlier, three people were killed in Gaza, in two attacks by Israel's army. 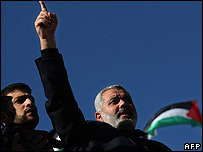 The Hamas leader, former Palestinian Prime Minister Ismail Haniya, launched a scathing attack on supporters of the peace conference. "We are sure that the Annapolis conference will not change the reality of history and geography," he told the crowd, amid chants of "Death to America" and "Death to Israel". "Any conference that goes beyond this reality is doomed to failure." Hamas, which the US regards as a terrorist organisation, was not invited to the Annapolis talks. Another Hamas leader, Mahmoud Zahar, said: "Today you are here to send a message to say the land of Palestine is not for sale." "Whoever thinks we will recognise a Jewish state are deluding themselves. There will be no recognition of the state of Israel." Meanwhile, an anti-Annapolis protester was shot dead in Hebron, in the West Bank, by Palestinian security forces loyal to Mr Abbas, who is in Annapolis. Others were wounded as Fatah-led forces intervened in Hebron and also in other West Bank cities like Ramallah and Nablus. Earlier in the day, two Hamas members were killed in an Israeli air strike near the Jabaliya refugee camp in northern Gaza, the Islamist movement said. Israeli military officials said the armed men were approaching the barrier between Israel and Gaza. And in southern Gaza, medical staff said a civilian was shot dead by Israeli troops near the Sufa crossing. However the Israeli army said that the man was crawling towards the crossing in a "suspicious manner". Israel has stepped up attacks on Gaza in recent months, in what it says is an attempt to stop Palestinian rocket attacks on Israel. Israeli forces killed four Palestinians in Gaza on Monday.